湖泊科学 2016, Vol. 28 Issue (1): 149-155. DOI: 10.18307/2016.0117. 陈婷婷, 姜涛, 卢明杰, 刘洪波, 杨健, 基于耳石微化学的长江靖江段长颌鲚与短颌鲚生境履历重建. 湖泊科学, 2016, 28(1): 149-155. DOI: 10.18307/2016.0117. CHEN Tingting, JIANG Tao, LU Mingjie, LIU Hongbo, YANG Jian. Microchemistry analysis of otoliths of Coilia nasus and Coilia brachygnathus from the Jingjiang section of the Yangtze River. Journal of Lake Sciences, 2016, 28(1): 149-155. DOI: 10.18307/2016.0117. 摘要：为了解长江靖江段两种刀鲚生态型长颌鲚与短颌鲚的生境履历的不同, 利用X射线电子探针微区分析技术研究采集自长江靖江江段的长颌鲚和短颌鲚个体耳石的锶和钙微化学特征.定量分析结果显示, 短颌鲚个体的耳石锶、钙比值(即Sr/Ca×103)稳定在2.00左右, 反映了其在纯淡水生活的习性; 而长颌鲚的锶、钙比值波动显著, 不仅具有对应淡水生活的低值(1.18±0.48~2.11±0.94), 还具有对应半咸水生活的高值(3.39±0.60~6.79±1.13), 反映了其溯河洄游的生活习性.短颌鲚因在淡水生活, 其淡水系数(FC)值均为1.00, 2013年和2014年长颌鲚的FC值分别为0.36±0.06和0.50±0.11, 证明了长颌鲚与短颌鲚群体间存在差异, 而且长颌鲚不同年份群体间也并不相同.长颌鲚和短颌鲚的洄游模式存在显著差异, 同时不同年份间的长颌鲚也存在生境履历差异.靖江段长颌鲚资源群可能来自不同出生地起源及生活史背景不同的群体.该江段是两类刀鲚的重要栖息地或洄游通道. 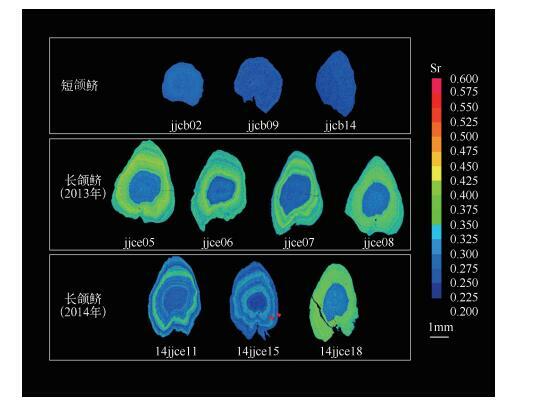 Abstract: In order to explore the different ecotypes in the life history of tapertail anchovy between its Coilia nasus and C. brachygnathus which live in Jingjiang section of the Yangtze River, an electronic probe microanalyzer was applied to analyze the micro-chemistry patterns of element Sr and Ca in otoliths of these two fishes collected from the Jingjiang section of the Yangtze River. Analysis results on the line transect showed that the Sr/Ca ratio (i.e., Sr/Ca×103) in the otolith of C. brachygnathus was consistently low (around 2.00), indicating that these individuals experienced in freshwater habitat during its whole life. In contrast, C. nasus had a fluctuation pattern of Sr/Ca ratio in the otolith from low to high, suggesting the individuals experienced not only in the freshwater, but also in the brackish water at different stages in their life history. All these differences could be well confirmed by the freshwater coefficient (FC). The value of FC in the C. brachygnathus was 1.00, and in contrast, the values of FC in the C. nasus for the individuals collected in 2013 and 2014 were 0.36±0.06 and 0.50±0.11, respectively. It confirmed an obvious difference of life history between C. nasus and C. brachygnathus, as well as C. nasus collected between different years. The present study demonstrated that the migration patterns were significantly different between C. nasus and C. brachygnathus, as well as C. nasus collected in 2013 and 2014. The resource of C. nasus in Jingjiang section might originate from different stocks with different natal waters and life history background. The water ecotypes in Jingjiang section of the Yangtze River must be the important habitat or migration channel for both tapertail anchovy. 短颌鲚(上颌骨长:16.15±3.96mm，上颌骨长/头长:0.88±0.07)的全长为120.00±2.10mm，体重为5.54±2.70g，年龄为1龄+.2013年所采长颌鲚(上颌骨长:47.69±2.91mm，上颌骨长/头长:1.11±0.02)的全长为309.80±2.23mm，体重为127.60±34.85g，年龄为2龄+.2014年所采长颌鲚(上颌骨长:45.10±3.08mm，上颌骨长/头长:1.12±0.06)的全长为271.00±2.07mm，体重为92.27±25.58g，年龄为2龄+.11尾短颌鲚耳石的微化学分析结果显示耳石从核心到边缘的Sr/Ca均较低(表 1)，各测定点的比值几乎不超过3；从核心到边缘比值的平均值最大为2.32±0.93(个体jjcb17)，最小为1.13±0.58(个体jjcb16)(表 1).与定量分析的结果相一致，面分布分析结果显示短颌鲚的Sr含量的面分布图均为蓝色(图 1)，说明其耳石上Sr元素的分布呈稳定低值，这与Yang等所记录到的陆封于太湖、全生活史淡水生活的刀鲚耳石Sr类型一致，表明本研究的短颌鲚仅生活在纯淡水环境.淡水中极低的Sr浓度会导致耳石中的Sr含量极低.本实验中短颌鲚年龄为1龄+，其耳石Sr/Ca稳定在2.00，符合淡水生活特征，不具有溯河洄游“履历”[12, 28].根据Jiang等对黄海刀鲚的研究发现鲚属鱼类在淡水环境中孵化生长不足1龄时就会进行入海洄游，可以认为本研究中所采短颌鲚均为纯淡水生活个体.沈林宏等发现，当幼鱼全长达到8cm时，长颌鲚与短颌鲚的上颌骨已经形成，前者上颌骨达到或超过胸鳍基部(即上颌骨/头长大于1)，后者上颌骨则不到.本研究中短颌鲚全长范围为8.6~14.9cm，上颌骨已经发育，可以区分判定为典型的短颌鲚个体.值得注意的是，徐钢春等对2013年4月同样在靖江段采集到的长颌鲚和短颌鲚进行耳石微化学分析时发现，所采1尾典型短颌鲚耳石Sr/Ca可以分为低值区(平均1.59±0.80)和高值区(平均4.38±1.33)2个阶段，与Yang等所记录到长江溯河洄游刀鲚耳石的Sr类型一致，表明短颌鲚中的一些个体也可以像长颌鲚一样参与溯河洄游.本研究中的短颌鲚未发现有洄游型，这可能反映出：(1)洄游型短颌鲚并不常见，(2)短颌鲚的洄游和定居生态型资源情况只能由耳石微化学等手段来区分，传统的形态学方法容易导致误判.沈林宏等在研究长江刀鲚幼鱼的采集时发现，在靖江段采集的渔获物中有不少短颌鲚，且在不同时间段刀鲚和短颌鲚的幼鱼捕捞所占比例不同，这表明靖江段短颌鲚的资源量亦不能忽视.如果不加以区分，很难做到合理地评价长江靖江段短颌鲚中较高价值的洄游型和较低价值的定居性资源量现状.鉴于目前刀鲚研究论文很少有上颌骨长数据以及刀鲚中长颌鲚、短颌鲚复杂生态型的现状，建议在今后相关论文中将提供上颌骨长等数据作为规范，以便更有效地把握所研究个体的生态型并提高结果的可比性. 与短颌鲚耳石的Sr/Ca结果不同，靖江段所采长颌鲚耳石的Sr/Ca大致可分为2~3个阶段(P＜0.05, Mann-WhitneyU-test)(表 1).个体jjce02、jjce04、jjce06、jjce07、jjce08与14jjce12、14jjce13、14jjce16、14jjce17、14jjce18、14jjce20从耳石核心到边缘的Sr/Ca可以分为第1阶段(Sr/Ca＜3，蓝色同心环区域，对应于低Sr淡水生境)和第2阶段(3＜Sr/Ca＜7，黄绿色同心环区域，对应于Sr较高的河口半咸水生境)(图 1).所有这些个体应该均为首次参加溯河洄游的刀鲚个体.虽然报道称刀鲚在1龄时即可参与溯河洄游，但是本研究中这些个体在淡水孵化发育后入海，＞2龄才进行溯河生殖洄游.进长江前，它们主要在河口附近盐度较高的水环境中栖息，且捕获前刚回到淡水环境.个体jjce05、14jjce11和14jjce19的生境“履历”较复杂，从耳石核心到边缘可以分为3个阶段，即Sr/Ca从低到高又降低，各部分的Sr/Ca平均值分别为1.50±0.68(对应蓝色同心环区域)、3.92±5.02(对应蓝绿同心环区域)和2.42±1.74(对应蓝色同心环区域)(图 1)，这显示其亦在淡水孵化并生长后入海，被采到前已溯河回淡水生活了一段时间.个体14jjce15的生境履历最为复杂，其从核心到边缘甚至可以分为5个Sr/Ca阶段，平均值依次为1.61±0.51、3.51±0.54、2.27±0.63、3.39±0.60和2.41±0.85，对应的Sr面分布图中亦可明显看出蓝色、蓝绿色、蓝色、蓝绿色及蓝色5个变化阶段(图 1).虽然导致这种现象的原因尚不清楚，但可能原因为该个体在被捕获前已经经历了1次溯河生殖洄游，且在第2次上溯过程中被捕获.袁传宓等对长江中下游刀鲚研究发现，有些刀鲚性成熟较早，1龄鱼即参加溯河生殖洄游.由此可见，14jjce15个体为2龄+并已依次相间地经历了淡水、河口、淡水、河口、淡水生境“履历”.结合其年轮情况，分别对应于第1年轮前早期生活史阶段幼鱼的降海过程、第1年轮和第2年轮间成鱼的溯河洄游和降海过程以及第2年轮外的上溯过程. 程万秀, 唐文乔. 长江刀鲚不同生态型间的某些形态差异. 动物学杂志, 2011, 46(5): 33-40. 袁传宓, 秦安舲, 刘仁华等. 关于长江中下游及东南沿海各省的鲚属鱼类种下分类的探讨. 南京大学学报:自然科学版, 1980, 3: 67-77. 陈卫境, 顾树信. 长江靖江段刀鲚资源调查报告. 水产养殖, 2012, 33(7): 10-13. 戴玉红, 顾树信, 郭弘艺等. 长江靖江段鱼类资源调查与开发. 水产养殖, 2013, 34(7): 28-33. 陈校辉, 边文冀, 赵钦等. 长江江苏段鱼类种类组成和优势种研究. 长江流域资源与环境, 2007, 16(5): 571-577. 孙莎莎. 最近10年长江靖江沿岸鱼类群聚特征的时间格局研究[学位论文]. 上海: 上海海洋大学, 2013. 刘凯, 段金荣, 徐东坡等. 长江口刀鲚渔汛特征及捕捞量现状. 生态学杂志, 2012, 31(12): 3138-3143. 张敏莹, 徐东坡, 刘凯等. 长江下游刀鲚生物学鲚最大持续产量研究. 长江流域资源与环境, 2005, 14(6): 694-699. 周宗汉, 林金榜. 刀鲚和短颌鲚血清蛋白聚丙烯酰胺凝胶电泳的比较研究. 南京大学学报, 1985, 21(1): 107-110. 程起群. 中国鲚鱼的形态变异、遗传多样性及系统发育研究[学位论文]. 上海: 复旦大学, 2005. 徐钢春, 顾若波, 刘洪波等. 长江短颌鲚耳石Sr/Ca值变化特征及其江海洄游履历. 水产学报, 2014, 38(7): 37-41. 沈林宏, 戴玉红, 顾树信等. 长江刀鲚幼鱼的采集与运输技术研究. 水产养殖, 2011, 32(5): 4-6. 陈锦淘, 戴小杰. 鱼类标记放流技术的研究现状. 上海水产大学学报, 2005, 14(4): 451-456. 姜涛, 周昕期, 刘洪波等. 鄱阳湖刀鲚耳石的两种微化学特征. 水产学报, 2013, 37(2): 239-244. Liu H, Jiang T, Huang H et al. 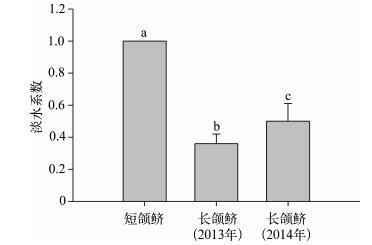 Estuatine dependency in Collichthys lucidus of the Yangtze River estuary as revealed by the environmental signature of otolith strontium and calcium. Environment Biology of Fishes, 2014, 98(1): 165-172. 熊瑛, 刘洪波, 刘培廷等. 基于耳石微化学的江苏吕泗近岸小黄鱼生境履历重建. 应用生态学报, 2014, 25(3): 836-842. Tsukamoto K, Nakai I, Tesch W. Do all freshwater eels migrate?. Nature, 1998, 12: 635-636. Jiang T, Liu H, Shen X et al. Life history variations among different population of Coilia nasus along the Chinese coast inferred from otolith microchemistry. Journal of the Faculty of Agriculture Kyushu University, 2014, 59(2): 383-389. 朱栋良. 长江刀鱼的天然繁殖胚胎发育观察. 水产科技情报, 1992, 19(2): 49-51. 董文霞, 唐文乔, 王磊. 长江刀鲚繁殖群体的生长特性. 上海海洋大学学报, 2014, 9(5): 669-675.